With Goals, you can directly measure how your flows are influencing user behaviors - including activation moments, feature adoption, upgrades and more. The Event or User Property criteria required to meet your desired end-result. How do you define the right goals? For User Onboarding and Education, create goals around "aha" and "activation" moments. Read more on activation as well as Onboarding and Education Strategies. For Feature Adoption, measuring through a goal can be a powerful way to optimize your flows and drive users to more deeply engage with your product. Follow the money! Creating goals around events that you know lead directly to revenue can help you measure ROI. 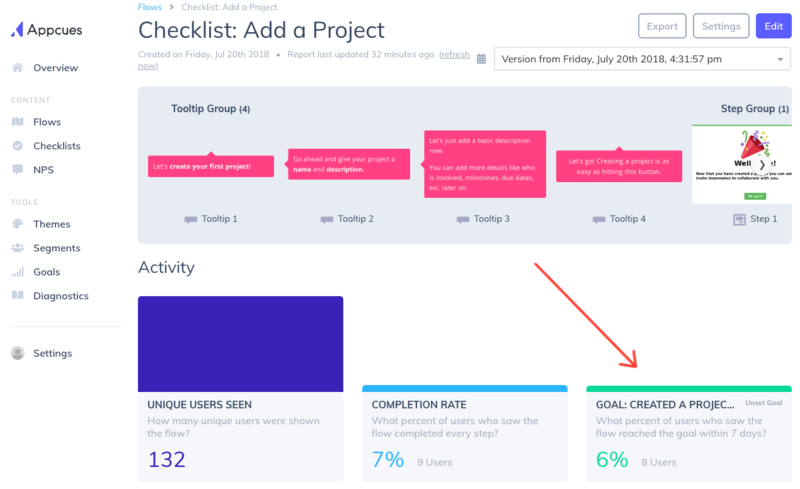 Once a Goal is connected to a specific flow, Appcues will begin tracking and reporting on how many of your users that saw the Flow also completed the Goal within 7 days (after 7 days we do not attribute Goal completion to a Flow). Goals are best utilized when they're directly related to an Event a user has taken within your application. Before creating the actual Goal, you should be sending the Event or User Property to Appcues. See the Events Overview for more on sending Events to Appcues. Alternatively, you can create a new Goal and add it to a Flow all right from the Settings page of a particular flow. Just check that you aren't duplicating an existing Goal, they can be used in multiple Flows. Why can't I select 'event' & why is it grayed out? How can I A/B test two flows effects on a goal? To see the results, you'll need to link the goal to each of the flows (see Using Goals above). Then you can visit the analytics page for each flow to see what percentage of users reached the goal after having seen the flow. This should allow you to see which flow has been more effective at driving users to the goal. How many goals can I set per flow? You can link one goal to a flow, but the same goal may be linked to many flows. When you link a goal to flow, you're simply defining the goal that will appear on flow's analytics page. Appcues will continue tracking all active goals, so you can change which goal is linked to a flow at any time to view the effect of the flow on those goals. What's the difference between goal and flow completion rate? The flow completion rate simply measures how many users completed every step of a given flow. It doesn’t tell you if a user took the intended action of the flow. Goals, on the other hand, allow you to specify the exact conditions which equate to success, and see how effectively your flow drives that user to take action. When a user first meets the criteria required for a goal, Appcues will record the event. This, paired with the knowledge of which flows a user has seen, allows us to provide a measure showing the percentage of users who saw a flow and also went on to reach the goal within 7 days. How long will my goal track? Your goal will track as long as it is active. For active goals, Appcues will track whenever a user meets the goal criteria for the first time. Appcues will not track these moments during the time that a goal is inactive but will resume tracking when a goal has been activated again. See Managing Goals above for more details on activating and deactivating goals. What happens when a goal is inactive? When a goal has been deactivated, Appcues will not track when a user begins meeting the goal criteria. The goal results are still available to be viewed on flows' analytics pages, but no new results are being recorded for that goal. A goal can be re-activated from the main Goals screen. See Managing Goals above for more details on activating and deactivating goals. Why can't I edit goals? In order to maintain the consistency and integrity of what it means to "reach a particular goal", we don't allow editing of goals. Modifying a goal after it has been tracked previously could cause us to track "success" more than once per user (once for each version of the goal) and would skew the data. Instead, if a goal must change, we suggest deactivating the old goal and creating a new goal for the new criteria. How many active goals can I have on my plan? 2 for Starter, 5 for Standard, 10 for Enterprise.